Nine people were injured in an attack by a man wielding a knife on a bus in northern Germany, officials said, although his motive remained unclear. The packed bus was on Friday heading in the direction of Travemuende, a popular beach destination close to the city of Luebeck, when a man pulled the weapon on passengers, Luebeck chief prosecutor Ulla Hingst said. Regional interior minister for Schleswig-Holstein state, Hans-Joachim Grote, told DPA news agency that six people suffered knife wounds and three others different injuries, while the attacker also punched the bus driver. "Luckily no-one was killed," Hingst said. "The background to the act as well as exactly how it happened are completely unclear and the objects of our investigation." The bus driver had immediately stopped the vehicle, allowing passengers to escape. "The passengers jumped out of the bus and were screaming. It was terrible. Then the injured were brought out. The perpetrator had a kitchen knife," a witness who lives close to the scene, Lothar H., told local daily Luebecker Nachrichten. Grote said the bus driver had avoided the worst by acting in a "fast and courageous manner". An unnamed female passenger on the bus said one of those injured had only just given up his seat to an elderly woman, "when the perpetrator stabbed him in the chest". A police car which happened to be close by arrived at the scene quickly, allowing officers to detain the assailant, the newspaper reported. Prosecutor Hingst told mass-market daily BILD that the suspected attacker is "a 34-year-old German citizen of Iranian origin". "We have no indication of political radicalisation of any kind," she said, adding that the suspect had so far not spoken about the incident. He is due to appear before a judge on Saturday. DPA reported that the man ignited a bag he was carrying with fire accelerants. There was no trace of explosives, the agency added. Police from Schleswig-Holstein said on Twitter that "people were injured. No one was killed. The perpetrator was overpowered and is now in police custody." While the motive has not yet been established, Germany has been on high alert after several deadly Islamist extremist attacks. Security services had long warned of the threat of more violence after several attacks claimed by the Islamic State jihadist group, the bloodiest of which was a truck rampage through a Berlin Christmas market in December 2016 that left 12 people dead. That attacker, Tunisian asylum seeker Anis Amri, hijacked a truck and murdered its Polish driver before killing another 11 people and wounding dozens more by ploughing the heavy vehicle through the festive market in central Berlin. He was shot dead by Italian police in Milan four days later while on the run. Germany has since been targeted again in attacks with radical Islamist motives. In July 2017, a 26-year-old Palestinian asylum seeker wielding a knife stormed into a supermarket in the northern port city of Hamburg, killing one person and wounding six others before being detained by passers-by. German prosecutors said the man likely had a "radical Islamist" motive. 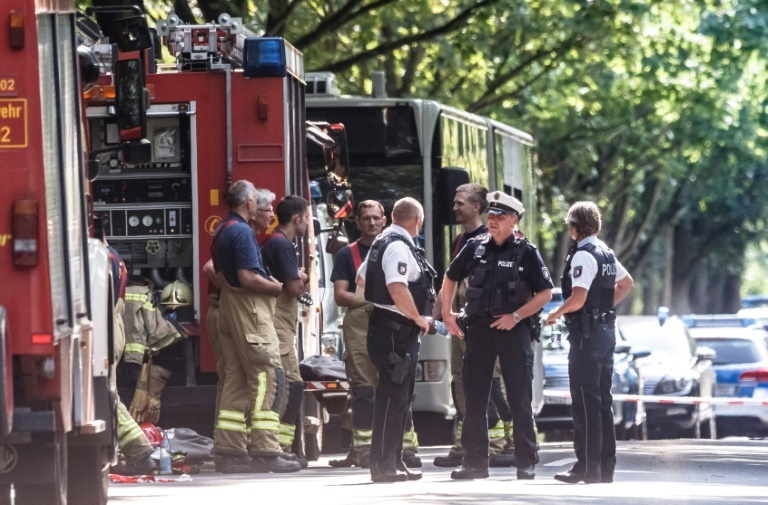 IS also claimed responsibility for a number of attacks in 2016, including the murder of a teenager in Hamburg, a suicide bombing in the southern city of Ansbach that wounded 15, and an axe attack on a train in Bavaria that left five injured. In June, German police said they foiled what would have been the first biological attack with the arrest of a Tunisian suspected jihadist in possession of the poison ricin and bomb-making material. Germany remains a target for jihadist groups, in particular because of its involvement in the coalition fighting IS in Iraq and Syria, and its deployment in Afghanistan since 2001. Security services estimate there are around 11,000 Islamist radicals in Germany, some 980 of whom are deemed particularly dangerous and capable of using violence. Around 150 of these potentially dangerous individuals have been detained for various offences. Chancellor Angela Merkel has allowed in more than one million asylum seekers since 2015 -- a decision that has driven the rise of the far-right Alternative for Germany (AfD) party, which charges that the influx spells a heightened security risk. 0 Response to "Knife attacker on Germany bus arrested, nine injured"